Last updated 31 December 2018 . By Georgia Evans. After decades of struggling to find quality Vietnamese food in Britain, owner Khoa Van returned to his homeland in search of traditional, authentic flavours with the assistance of co-owners Sang Siu and Samuel Baker. 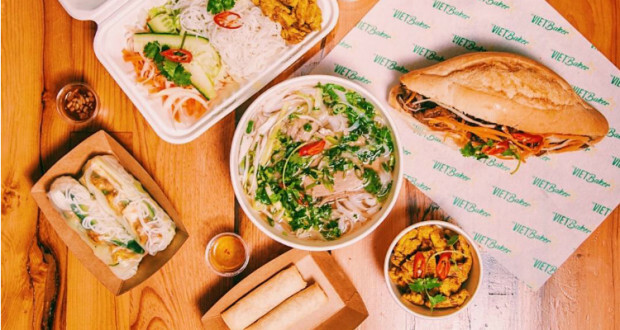 Upon their return, The Viet Baker was conceived, bringing authentic Bánh Mí and Phở from the streets of Hanoi straight to the heart of Leeds. The charming, rustic eatery is scattered with traditional artwork and murals with an open kitchen omitting aromas of Vietnamese delicacies. The menu is a concise selection of authentic dishes, one specialty being the Bánh Mí, a baguette filled with meats or vegetables which was created during the time of French colonialism. There’s also the classic Phở, inspired by a combination of family recipes, that’s simmered overnight with bones and marrow. If you’re searching for something a little lighter, Bún Chả may just do the trick. The BBQ meat rice noodle salad became a sensation in the West after Barack Obama ordered it when visiting Hanoi as president. There’s also small snacks such as chilli bread sticks and prawn toast to nibble at while sipping on Hanoi green tea or Trung Nguyen, traditional Vietnamese coffee.